A rendering of Costco Wholesale store proposed for New Orleans by MulvannyG2 Architecture of Seattle. Over the past six years, the Carrollton-Hollygrove Community Development Corporation has been involved in countless meetings focused on the fate of the large empty lot on South Carrollton near the interstate. On Wednesday evening, surrounded by drawings and renderings of the Costco Wholesale store proposed for the site, CDC member Joe Sherman told store officials he has high hopes for their plans. With memberships starting at $55 a year, the warehouse-style store offers far fewer items than other big box retailers, but makes its purchases in such high volume that it is able to offer them at substantially reduced prices, even for items of high quality, explained Jackie Frank, a vice president for real-estate development. Merchandise includes groceries, housewares, electronics, jewelry, clothing and furniture with an in-house bakery and butcher shop, and Frank noted that Costco is the largest seller of fine wines in the country. The store will also have a pharmacy that state law will require is open to anyone. “There’s not a lot of selection, but our commitment is to an extraordinarily high quality product,” Frank said. The company prides itself on treating its employees well, Frank said, offering $11 an hour in starting wages, an average salary of more than $48,000 after five years, benefits to nearly 90 percent of employees, a turnover of less than 10 percent annually and millions of dollars per year in charitable donations. “When you pay your employees a living wage and provide good benefits, employees naturally want to give back to their communities,” Frank said. The site plan for the proposed Costco Wholesale store on South Carrollton (click to enlarge). The store planned for South Carrollton will have two components, the warehouse itself on the rear of the lot and a fueling station closer to Carrollton. The warehouse’s entrance will sit at a 45-degree angle into the 400-space main parking lot, and the long exterior wall along Cambronne and the neighborhood behind the store will be “quiet” with no entrances or loading docks, essentially using the building itself to screen the neighborhood behind it from the noise of the parking lot. 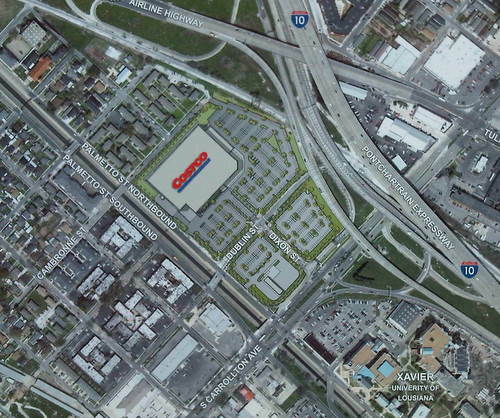 Costco also plans extensive tree planting along Cambronne, Frank said, and is in talks with the city about rebuilding the street there altogether: replacing curbs and sidewalks, repaving and adding street lighting. The existing streets through the property, Dixon and Dublin, will divide the parking lot into quadrants, and traffic engineers are studying the possibility of adding traffic signals at any of three locations: Carrollton at Palmetto or Dixon to help cars come into the store, and Dixon at Dublin, to calm traffic through the lot. A secondary parking lot with about 200 spaces, farther from the store, will serve employees, and the fueling area will have a small amount of overflow parking as well. Part of Dublin inside the lots may be changed to four lanes all in one direction to help move traffic, Frank said. The store is not a done deal, but the company’s research into the project has yet to turn up any red flags, Frank said. After planning, permitting, design and construction, the store could open in spring of 2013, he said. City Councilwoman Susan Guidry opened the meeting by praising Costco for holding so many community meetings at such an early stage in the development process. Tim Garrett of the State Street Drive neighborhood asked Frank to consider creating recycling stations for unusual items. “New Orleans is in need of every chance they can get to recycle tires, electronic waste, batteries and et cetera,” he said. Frank replied that part of Costco’s business model is generating very little waste, but that it makes extensive use of recycling, and called Garrett’s idea a good one. The stores also go to great length for energy efficiency, using skylights during the day so that the interior lights aren’t even turned on. Another Uptown resident, Richard Dimitry, asked if local goods would be included in the offerings, and Frank said that local stores have a tradition of promoting products by local entrepreneurs. Dimitry also asked if store officials were aware that development plans from years past had included extending nearby Leonidas Street to Airline Highway — which could potentially create another route into the store — and Frank said they had not run across that plan but would inquire about it. Hollygrove resident Larry Morgan also praised the store’s plans and said he felt confident Costco would be a fair employer to neighborhood residents. He urged the company to choose the recipients of its charitable efforts carefully, however. Amid the accolades showered on Costco during the two-hour open house, there were a few voices of caution. Clarence Mitchell, a Xavier University graduate who lives on Howard Avenue, asked whether a project the size of Costco was a good fit next to the university, and whether better sites were available around the city. He said he wasn’t necessarily opposed to the store, but hoped city officials would push Costco for the maximum possible contribution to the community. Rashad Arcement, another Xavier graduate, spoke up from the audience in an attempt to quell Mitchell’s concerns. He said he recently moved back to New Orleans from Washington, D.C., and missed the Costco he left behind. Frank took that praise in stride. Costco will hold another community meeting at 5 p.m. tonight (Thursday, Oct. 20), in the auditorium of the pharmacy building at Xavier University. I can’t wait! We need this so much! Great Great Great news! I agree with Robyn! That’s excellent news about Costco coming! It is a very good store with a plethora of great items.